Mr. Kazuhiro Matshushita, General Director of Panasonic Vietnam, tells VET about the company’s business performance and social responsibility activities. ■ What are your thoughts on Vietnam’s business and investment environment at this time? I see steady improvements in the business and investment environment. Vietnam jumped five places to 55th among 137 countries and territories in the World Economic Forum’s competitiveness rankings in 2017 and recorded the highest economic growth for a decade in 2018. I believe it will continue to be an attractive foreign investment destination. Many Japanese companies clearly think likewise, as Japan became Vietnam’s largest foreign direct investor in 2017 and 2018. The CPTPP took effect on January 14 and I expect it will bring tremendous benefits and new business opportunities for Vietnam. Vietnam has consistently been an important and developing market for Panasonic in the Asia-Pacific region. ■ Can you tell us about Panasonic Vietnam’s business performance in Vietnam over the last year? How significant for the company is manufacturing and processing in Vietnam compared to other countries in the region? During its more than 60 years of doing business in Vietnam, Panasonic has been a leading brand in consumer electronics and continues to expand in a range of fields. In FY 2018, it forecast sales turnover more than $1 billion, enjoyed a double-digit increase versus the previous year, and grew across almost all businesses, with total investment of $243 million. Sharing his vision for Panasonic over the next 100 years, President Kazuhiro Tsuga emphasized a strategy of “co-creation” and “lifestyle updates” to enrich customers’ lives. Vietnam is a strategic market for Panasonic in Asia-Pacific and is part of the company’s overall development strategy for the new era. As a principle business philosophy, we continue our contributions to sustainable development in Vietnam through not only business activities but also corporate social responsibility activities in education and environment. One highlight has been Panasonic Risupia Vietnam, established in 2010 at the request of former Deputy Prime Minister Nguyen Thien Nhan which offers Vietnamese students a meaningful playground and free access to science exhibitions and the latest technologies. More than 600,000 students and visitors nationwide have visited since opening. 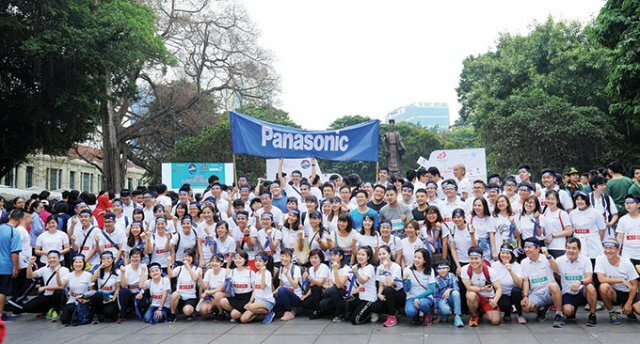 Other activities, including the Panasonic Scholarship Program, which supports Vietnamese students to realize their dreams, a project providing 100,000 solar lanterns to remote communities lacking electricity access, and the Eco relay program, an annual activity of Panasonic where all employees from Panasonic Vietnam Group companies volunteer to participate in tree planting and environmental protection activities. ■ Vietnam’s manufacturing and processing sector saw growth of 12.98 per cent last year. What are your thoughts on this? What factors support the sector’s growth and its lead position in attracting FDI last year? The sector made a major contribution to Vietnam’s GDP growth last year, which was the highest level in a decade, according to the General Statistics Office (GSO). The 12.98 per cent growth was the result of actions from the government, such as restructuring the entire industry’s growth model, implementing solutions to overcome problems, and creating a favorable environment for production and business. It was also the result of the effective use of opportunities under bilateral and multilateral FTAs, which contributed to market expansion and greater investment in domestic production, promoting Vietnam’s export growth. To maintain the sector’s momentum, I think Vietnam should continue to attract FDI from investors boasting modern technology, good corporate governance, and a high level of competitiveness, while strengthening ties between foreign-invested and domestic firms, particularly those in manufacturing and processing. ■ How has Panasonic pushed up its investment in Vietnam recently? What challenges is the company facing? With our strengths in technology and manufacturing experience, we commit to providing Japanese quality products and innovative solutions to create a better life for Vietnamese people and contribute to the country’s prosperity. For example, we researched concerns in society about air quality and addressed it with our Quality Air For Life solution, to help improve living conditions and enrich people’s lives. We will continue to promote the value of “co-creation” in our strategy and introduce the “lifestyle updates” concept, providing products and services that evolve with the individual end-users’ personal preferences and way of life, as President Kazuhiro Tsuga told the Cross-Value Innovation Forum 2018. Our business vision focuses on Panasonic’s advanced technology and innovation, which brings about a comfortable life to humankind and the environment. Panasonic will continue to prioritize customer satisfaction and commit to our Basic Business Philosophy of contributing to society as a public entity. In addition to expanding our business activities, we are also pleased to welcome the opportunity to cooperate with Vietnamese enterprises in the supply of production materials, distribution of products, customer service, and other business support activities. This not only helps Panasonic and our business partners develop, it also gives Vietnamese consumers the opportunity to own and use Japanese quality products and services and to contribute to Vietnam’s economic growth and sustainable development. In order to do that, we need ongoing support from the government to create a more favorable environment for foreign investors, especially regarding administration procedures and legal framework. We at Panasonic understand that Vietnam targets increasing the local procurement rate and building up national manufacturing capabilities. At present, however, we still have to import a certain volume of components and materials. We also hope to receive ongoing cooperation from Vietnamese authorities to facilitate and recognize our activities in education and the environment, so we can contribute more to Vietnamese society in the future. ■ What should the government do to continue attracting more FDI into the manufacturing and processing sector? As mentioned before, the CPTPP is expected to bring tremendous benefits and new business opportunities to Vietnam and enable it to attract FDI in the years ahead, especially in the manufacturing and processing sector. Vietnam’s business investment environment still has room to develop and improve further. The lack of support industries has behind the low local procurement rate of around 36 per cent, according to JETRO figures in 2018 for Japanese companies. Sources of high-skilled engineers need to be developed further, to meet requirements and the drastic changes we are seeing and are likely to see around the world during Industry 4.0. In the last 60 years, to overcome such weaknesses in investing and doing business in Vietnam, Panasonic has developed a fully-functional business model, from R&D and manufacturing to distribution, and at the same time steadily developed various CSR activities to contribute to society’s sustainable development. We will continue to cooperate with the government of Vietnam, the government of Japan, and related organizations, to expand our business in different fields, develop our workforce through R&D activities and human resource development programs, and contribute to society through unique educational and environmental projects. More importantly, we commit to developing high-quality “Made in Vietnam, Make for Vietnam” products in pursuit of “A better life, a better world” for Vietnamese people.